Beng Mealea was probably the most exciting temple that we visited in Cambodia. The architecture is quite similar to Angkor Wat but the temple layout, a series of galleries on a single level, is vastly different. 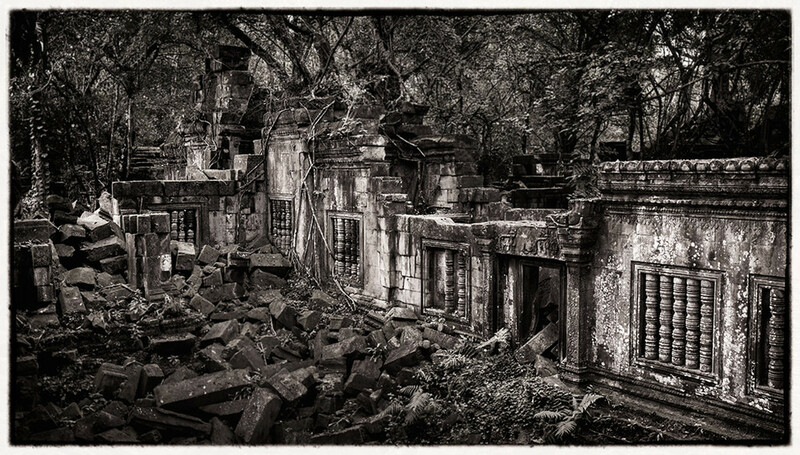 Beng Mealea is probably the most significantly damaged of the jungle temples but the authorities are quite permissive in allowing exploration. Tumbled stones create somewhat precarious steps to the top of walls along which visitors are free to walk. It truly feels like exploration but I expect that in the relatively near future access is going to become more limited. The stress of people climbing through the ruins is threatening the integrity of the site which leaves me with mixed emotions. I am glad that I got to experience this magnificent temple the way that I did but there is a lingering guilt that I have contributed to the degradation of their amazing place.